In The Inquisitor, our protagonist wakes up in New York City with no knowledge of who he is or where he's been, but possesses a keen survival instinct. Managing to get work on construction sites for cash, he eventually gives himself the moniker of Geiger and earns the trust of the local mob. His friends in dark places provide him with the economic means to utilize his true talents and start up his own company in "information retrieval." An unconventional business model, sure, but a man with amnesia has got to make a living. For the past 15 years, Geiger has become extremely skilled in his chosen profession and knows the best ways to push people to their limits through psychological rather than physical torture. Whether working for the government or for criminal enterprises, Geiger has only one drive: to get to the truth (there's some pretty broad symbolism in his name; like a Geiger counter detects radiation, our Geiger can detect the truth amid his victim's desperate lies). When a child is brought to him under questionable circumstances, Geiger finds a conscience and helps the boy, Ezra, escape. In doing so, the walls his mind put up to keep out the demons of his past begin to crumble, threatening not just his safety, but that of those he's vowed to protect. I thought I would be getting a fresh take on the thriller and, while this is a serviceable entry into the genre, it tells a safe, by the numbers tale. Like most of its ilk, it's completely implausible, but it is better written than most, falling somewhere between David Morrell and Robert Ludlum. Still, it has a highly-polished movie script feel to it. (In my mind, I was already playing casting director, and that's not a particularly good sign as it usually means I'd rather be seeing the movie version--by the way, I've settled on either Jeremy Renner or Daniel Craig to play Geiger; have their people call my people and let's make this thing happen, baby). The big reveal in the end is a letdown and doesn't really seem like the type of thing that would kick up all of the fuss in the novel. The biggest problem for me was the character of Geiger himself. Seemingly emotionless not just in the interrogation room, but in life as well, Geiger isn't the type of character one can connect or empathize with. He approaches his torture with a cold, clinical precision, but I suppose we're supposed to see the moral core hidden deep, deep down in his psyche because he tries to actively avoid physical harm. His lack of relationships and his refusal to engage with the world outside the limited one he's built for himself make him seem inhuman. There's some definite overtones of Terminator 2: Judgment Day here. Like the Arnold Schwarzenegger character, Geiger is a badass mofo who protects the young Ezra and in a hesitating, halting manner, begins to express human-like emotions. It's dude-lit in which men get to envision themselves as steely-eyed, square-jawed, testosterone-fueled protectors willing to sacrifice themselves so that others may live. Like I said, we've been here before. The one thing that should make Geiger intriguing, his repressed past with a father whose motivations are unclear, is never as fully explored as I hoped (is he trying to protect his son from a known danger, or is he just a sadistic survivalist intent on making his boy as tough as possible?). While we do begin to get a clearer picture of what the young Geiger endured, Smith isn't putting all of his cards on the table yet as this is clearly intended to be an enduring series. 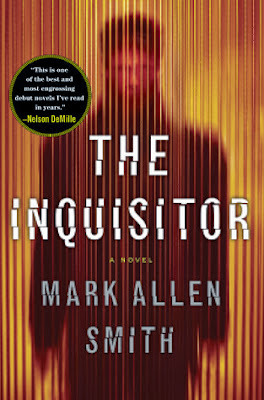 The Inquisitor is what it is and, for what it is, it's fairly well done. However, the stock characters and lack of psychological depth means I probably won't be coming back for seconds.